Yantai Camp Update (4) – Dead fish for lunch? 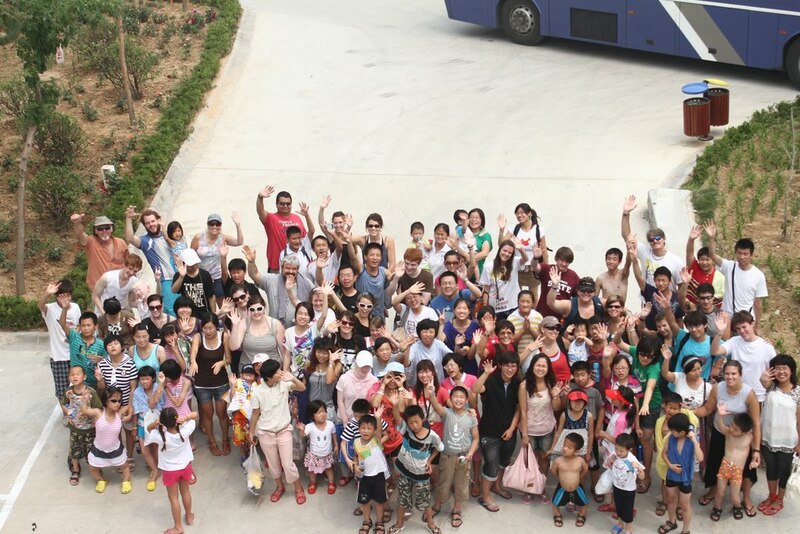 Our final week in Yantai we were blessed to have 38 kids! We had toddlers, teenagers, and for the first time at Yantai we had a nearly even spread of boys and girls, which made many of the ladies happy to finally be paired with girls! We also threw in a few surprises for the finale of camp, including our very own version of a rock show! But let’s not get ahead of ourselves. On Monday we had kids from three orphanages arrive and we knew right away this was a rowdy group. We had kids of all shapes and sizes running around and none of them were worried about being shy. Right off the bat we had craft time and then due to a continuing difficulty with the pool we went straight to the waterpark. Unlike weeks past, these kids took to the water like…well, like fish to water, and without any hesitation they took control of the waterslide. Tuesday was a day of crafts, games and the lasts scavenger hunt, which was finished in record time by Shiloh, Finwake and their volunteer, Willie, not to mention their two boys. After an afternoon of ice cream at KFC we were back to camp for an assembly and discovered that Mary, a girl from the Yantai orphanage, was a very accomplished singer who treated us to a Chinese pop song that finished to a standing ovation! But that was not the end of the musical talent from this group. On Wednesday we had an impromptu music recital as one little girl brought out a violin and played through Aul Lang Syne, and then was joined by Mary on Piano, and after they were finished one of our rowdier boys, Daniel, took a turn at the mic to sing his little heart out. We were also finally able to return to the pool and the kids loved it! Most every kid mentioned swimming in their letters to their volunteers and despite the water still having a somewhat green tinge to it, we were all thrilled to be back underwater and out of the hot hot heat! It was also a chance to continue teaching some of the translators to swim, and while none of them are interested in trying out for the Olympics yet, they will be able to get themselves across to the deep end and back again. Thanks to the return of the sun and all the heat that came with it we were also able to get back to the beach. It was a great day of sun, small surf and rides on the jet skis. It was also great for the kids to catch some of the wildlife swimming through the Chinese beach. It was a highlight moment when one of the kids brought a flat fish up to the sitting area and tried to feed some algae to the little guy, all the while saying “Hungry fish eat” in Chinese. It was even better when the boy searched around for a plastic bag and dumped the fish and some salt water into the bag to bring him home. Luckily we were able to convince him that fish are better off in the ocean. Thursday night assembly came up and the rock show was on. The Mahoney family returned to camp for the final week and while they once again forgot their instruments, they remembered to rock! They put on a show for the kids, singing and dancing to one of the songs from their album “Do Make Room” and then went on to sing some of the camps songs the kids had learned during the week. The finale of their show was a new song they wrote specifically for camp, “Shout for Joy”, which everyone has been singing since. Then as a prelude to the slumber party we took the kids out and put on our very own fireworks show complete with rockets, spark showers and even a few mortar shells blasting high into the sky! Friday was goodbye day and we were given a short reprieve with the kids to just hang out, take pictures and talk when a misunderstanding brought one small van to carry eighteen kids and two volunteers. There were long hugs and tearful goodbyes that would continue even after the kids were gone. After the kids were gone, it was time for the translators, volunteers and staff members to go their separate ways. Some are returning home, others are heading to further travels and a few are remaining for the first ever Chinese run camps. It was four weeks of love, friendship, laughter, big smiles and a few sad moments sprinkled in, but from all of us at Yantai we want to thank everyone for their prayers and support, and especially our volunteers and translators for all their hard work! Dennis is a former staff member who returned for the last week of camp to translate and he was paired with two boys. During the week his boys looked after two boys from another orphanage, both of whom were developmentally disabled. Despite these boys never meeting before camp and being from completely different orphanages, they formed their own brotherhood and looked out for each other the entire week. One day Dennis’s boys even made sure to keep some food on the table when Bekah and her boys were late to dinner. During family time on afternoon Lindsay took her boys to the local market to buy some snacks. The boys had never seen an escalator before and took turns riding it up and down, thinking it was a ride instead of a convenient way to travel between floors! The boys, who began the week sitting quietly during assembly, ended the week by jumping up during the assemblies and dancing and singing loudly. Matthew, a volunteer, speaks no Chinese and his boy spoke no English. Despite the differences in their language Matt’s boy was determined to communicate without a translator, and by the end of the week he had developed a complicated series of gestures and hand signals, his own version of charades, that allowed him and Matt to communicate! Kaisha was paired with two very difficult girls this week, both whom suffered from severe attachment disorder. After a frustrating week where the girls avoided her, Kaisha did her best to remain close to them without trying to smother them. During an elevator ride Wednesday night one of the girls was having a snack and shared it with the other girl. The girl took the shared snack, looked up at Kaisha and offered to share the snack, and the three of them ate together. This entry was posted in Bring Me Hope News and tagged Yantai on August 7, 2010 by admin.